The Never Summer Mountains of Rocky Mountain National Park reflect in the Beaver Ponds of the Kawuneeche Valley. 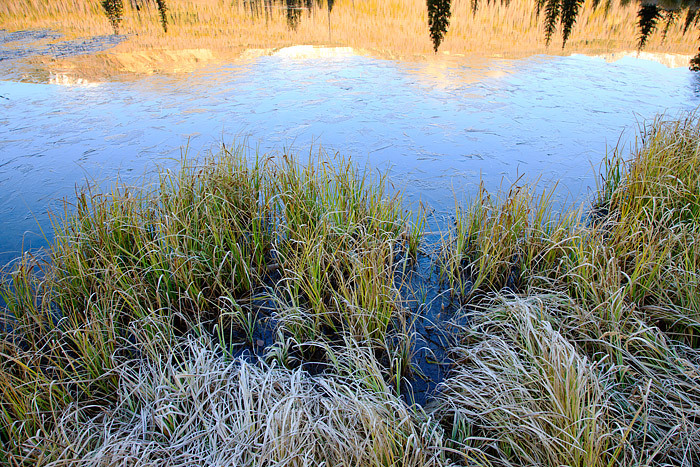 A cool Colorado Autumn night has brought a heavy frost to the still green grasses along the shores of the Beaver Pond, and ice has started to form on the surface of the water. The Kawuneeche Valley on the west side of Rocky Mountain National Park is a popular location to view Moose that are often found in and around the many ponds and streams of the valley. Photo © copyright by Thomas Mangan.